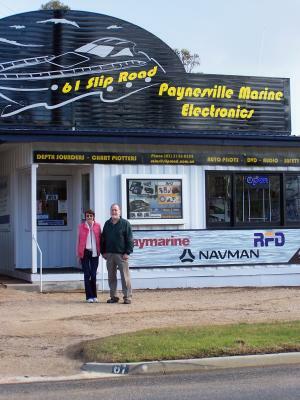 Paynesville Marine Electronics owned and run by Frank and Dorothy de Vries. With a lifetime experience of mechanical and electrical problem solving in the custom automotive manufacturing trade they bring enthusiasm and electronic expertise to Paynesville. Specializing in Lowrance ,Simrad and Raymarine electronics, Koden communications and Coursemaster autpilot, RFD safety gear and all kinds of other bits'n'pieces they are providing a great service to us and our clients. Being next door is just a bonus.